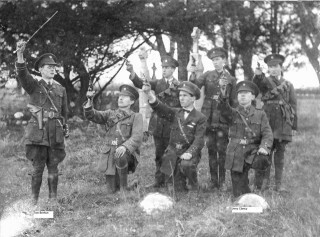 Members of the Ballygar Volunteers firing shots in Killeroran graveyard. circa 1916. Jerry Clancy (O/C) is kneeling in front at the far right. Tom Brehon is standing on the left. 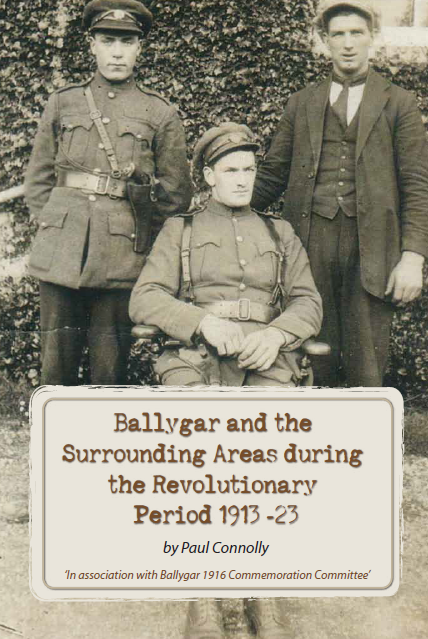 On the 19th of May 1918, Ballygar Volunteers Jerry Clancy and Tom Brehon assembled a group of Volunteers in the square in Ballygar. They numbered over 100 and a quarter of them wore military style clothing. Both Clancy and Brehon wore cap, belt, bandolier and haversack. Shortly after this event took place both Clancy and Brehon were arrested by the RIC for illegal drilling and were held at Ballygar barracks. A sympathetic crowd gathered outside the barracks and this crowd also included some members of the Volunteers. The crowd grew in size and a band also arrived at the barracks, this further bolstered the size of the gathering. Ballygar Volunteers, circa 1917. 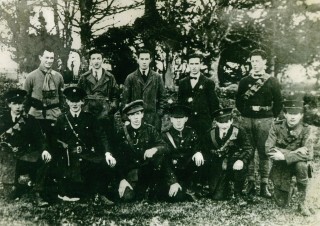 Tom Brehon is 2nd from left (front row). Jerry Clancy is 4th from left (front row). Mr. Rice, the Royal Magistrate, arrived from Castlerea and made his way to the courthouse where he remanded both men in custody until the 17th of June and ordered their removal to Galway Jail. The local press reported that the Volunteers had made it very difficult for the magistrate to get to Ballygar and that they cut down trees on the approach roads and barbed wire was strewn across the roads, this was later disputed by the townspeople. After the case was heard, the magistrate could not make it out of Ballygar and had to return to the barracks. The police later accused the crowd of becoming violent and arming themselves with objects taken from Fitzmaurice’s forge nearby. Again, this was disputed by the townspeople. The District Inspector failed in his attempts to disperse the crowd and he then made a very serious decision; he ordered his men to fix bayonets. They charged at the crowd, scattering them in all directions and this was repeated a second time. At least seven people received stab wounds from the bayonet charges. The crowd dispersed and the wounded were treated locally by sympathetic townspeople. 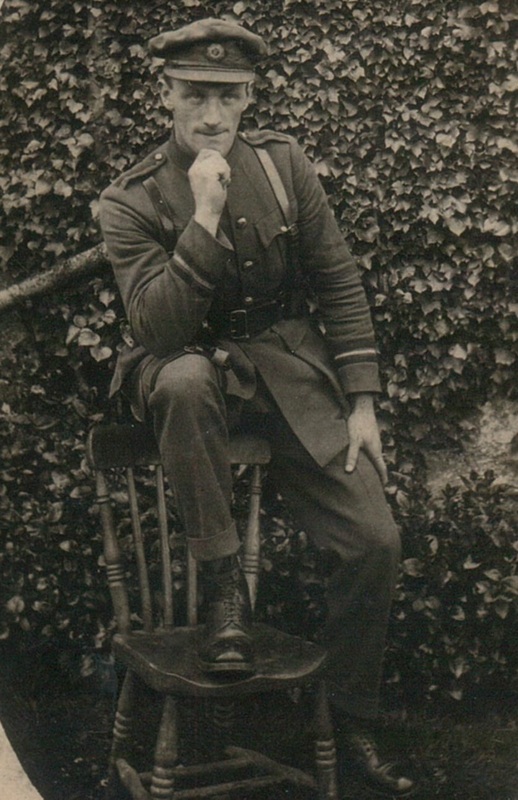 A local man called John Egan received a wound from a bayonet thrust and Thomas Glynn was seriously injured in the buttocks during the interval between the bayonet charges. The visibly shaken Magistrate made his way back to Castlerea and the local people now awaited the trial of the two prisoners. Andy Lohan, Hermitage, Ballygar; Adjutant of the Ballygar Volunteers. The trial took place at Galway Courthouse on Monday the 17th of June 1918 before Magistrates Mr. Kilbride and Mr. Hill. Constable Mallane of the RIC in Ballygar told the court that ‘both men were in command of about 100 men that day in Ballygar’ and gave them military orders and marched them from Ballygar to Athleague, a distance of 5 miles and back. He heard Brehon say: “fall in, stand at ease, and other military terms.” The volunteers marched in a 4 deep formation from Ballygar, through Mount Talbot and on to Athleague lead by a fife and drum band. When they returned to Ballygar, Clancy was overheard giving the order “left turn” and they were then dismissed. The defence argued that it was Pentecost Sunday in Ballygar and the march was part of a religious procession. They claimed that the march was approved by the parish priest, Rev. Dr. Kielty and it was not of a military nature. The court or the authorities did not know that Rev. Kielty was a Sinn Féin member and a close personal friend of both Clancy and Brehon. The defence further claimed that there were women and children in the march and no military terms were spoken by the defendants. They did however admit that military uniforms were worn by some of the participants of the march. The magistrates had no doubt that this was a military exercise and gave both men a one month prison term. They served their sentence in Belfast where Clancy took part in a hunger strike that was happening at this time within the prison. This extraordinary event was the only time a bayonet charge is recorded in the country throughout the revolutionary years. It resulted in a large increase in support for Republicanism and membership of the local Volunteers increased after this event.